Samsung's latest smartphone (running Android) by the end of 2014 is Galaxy Note Edge, which was announced together with the brand new Galaxy Note 4. 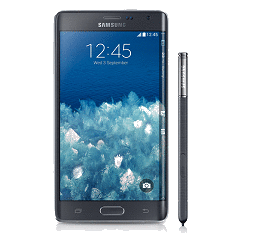 Samsung Galaxy Note Edge embraces 5.6" big HD display screen, a thin 8.3mm frame, Quad HD resolution, a 2.7 GHz Quad-core Snapdragon 805 with 3GB of RAM, Android 4.4.4 KitKat with Samsung TouchWiz, 16MP camera with Optical Image Stabilization, 3000 mAh battery, and 32/64GB internal memory and support up to 128 GB of expandable storage. But ripping DVD to Samsung Galaxy Note Edge is still the concern of many users since the phone does not have a built-in disk drive. How to Rip DVD to Samsung Galaxy Note Edge? Rip any general and copy-protected DVDs to Galaxy Note Edge on Win/Mac. Among the vast of DVD rippers in the market, which are the most suitable ones for the new Galaxy Note? We can see the review on the best 3 free DVD to Samsung Galaxy Note Edge first, in which WinX DVD Ripper, Format Factory and Handbrake are especially recommended for free ripping DVD to Galaxy Note Edge. They support common DVD discs and folders, but still have some limitations. For example, Handbrake must be used in combination with VLC and has no profile for special Android device model, not at all; Format Factory can only convert a DVD to some general videos, instead of portable devices and audio files; WinX DVD Ripper at the fastest conversion speed and easiest use can rip most DVDs to general Samsung mobile phones and tables, including Galaxy Tab, Galaxy S, Galaxy Spica, Fascinate, Behold T919, intercept, Transform and Mesmerize. It can realize free ripping DVD to Samsung Galaxy Note Edge, but you may need to find the most proximate profile and make some annoying parameter settings. If you prefer to do it more conveniently, the premium edition of Samsung Galaxy Note ripper is the way to go. It will help you rip ANY DVDs to Samsung Galaxy Note Edge and Note 4 directly with the ready-made presets for them. That is to say, you can watch the latest movies Transformers 4, Guardians of the Galaxy, Teenage Mutant Ninja Turtles on the new Android smartphone regardless of Sony ARccOS, UOPs, Disney X-project DRM, CSS, region code, RCE, etc. To begin your journey of converting DVD movies to Samsung Galaxy Note Edge, please first download the latest version of WinX DVD Ripper Platinum or DVD Ripper for Mac on your PC or Mac. Step 1. Hit DVD Disc (ISO Image/Folder) button to import DVD movie to WinX DVD Ripper Platinum. Step 2. DVD will be completely loaded with selection of auto-detected main title a few of seconds later. Get Android Mobile category from popped-up Output Profile windows. Select "to Samsung Mobile Video" > Samsung Galaxy Note Edge (H264/MPEG4). In addition, you can convert DVD movies to other Samsung devices (for example Galaxy Note 4/3, Galaxy S5/S4) and iPhone 6/6 Plus, iPad Air 2/Mini 2, HTC One, Kindle Fire, Xbox One etc. Step 3. Hit Browse button to set destination folder for saving converted DVD movies. Step 4. Hit RUN button to start DVD movies to Samsung Galaxy Note Edge conversion. What after ripping DVD movies on Windows or Mac? We should transfer the movies/videos from PC/Mac to Samsung Galaxy Note Edge to watch full movies on the smartphone on the go. Step 1. Connect your Galaxy Note Edge to your PC/Mac with the matched MicroUSB to USB data cable. Step 2. After connection, go to notifications and select "USB Mass Storage." Until the computer recognize the device as an external hard drive. Step 3. On the interface of the computer, copy or move the movie files from the computer to Samsung Galaxy Note Edge. Step 4. After finishing the transferring, go to the notifications on the phone and click "Turn Off USB Storage." Then disconnect the device and you can watch the movies on your handset anywhere anytime. Note: Please check DVD copyright laws in your country carefully before ripping DVD to Samsung Galaxy Note. WinX DVD Ripper Platinum - Rip and backup any DVDs (even latest copy-protected DVDs) to Samsung Galaxy Note Edge/Note 4/S5, iPhone 6/6 Plus, , HTC One and other devices with no effort at all.